Before Sandy blows off our roof and wipes out our power for a week, I wanted to post the winner of the first Subee’s Kitchen giveaway. 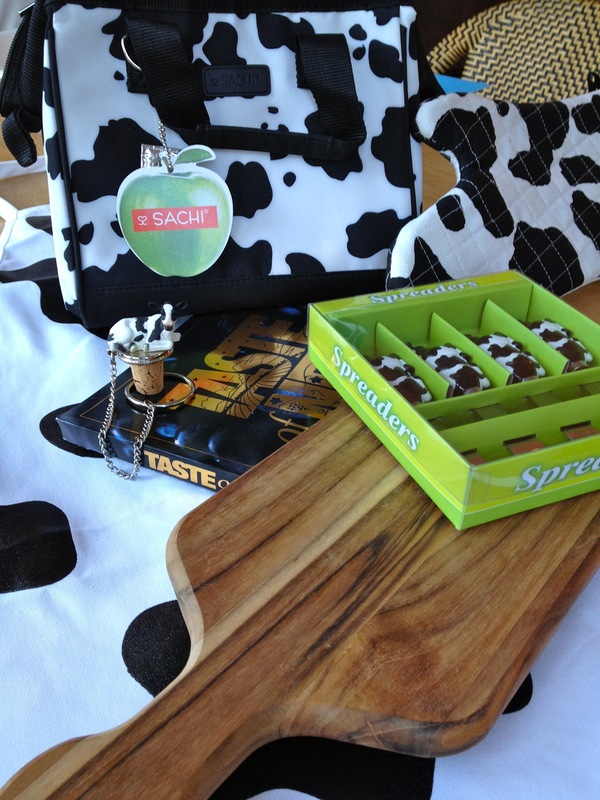 Congratulations to Dani F., who will receive this “bovine bounty” bag of dairy-themed gifts! (Winner selected using Random.com.) Dani posted that one of her favorite uses for cheese is her friend Karen’s cheese puff appetizers. Maybe Karen will share her recipe? I love a good cheese puff. By the way, the cauliflower gratin recipe I promised is still in the works. I made one with cheese and cream the other day, which was rich (imagine that) and delicious, especially served alongside pork tenderloin braised in apple cider. Next I was going to try a version with a white sauce (flour/butter/milk) instead of cream to see which one I liked better. However, this effort has been stalled by Halloween parties and Sandy preparations (gas, water, wine, cat food), so please stay tuned. If we’re in the dark this week, I’ll be posting some “use up the food that’s in the fridge” creations until the laptop runs out of juice. Speaking of creations, I came up with this one today on the way to Target. 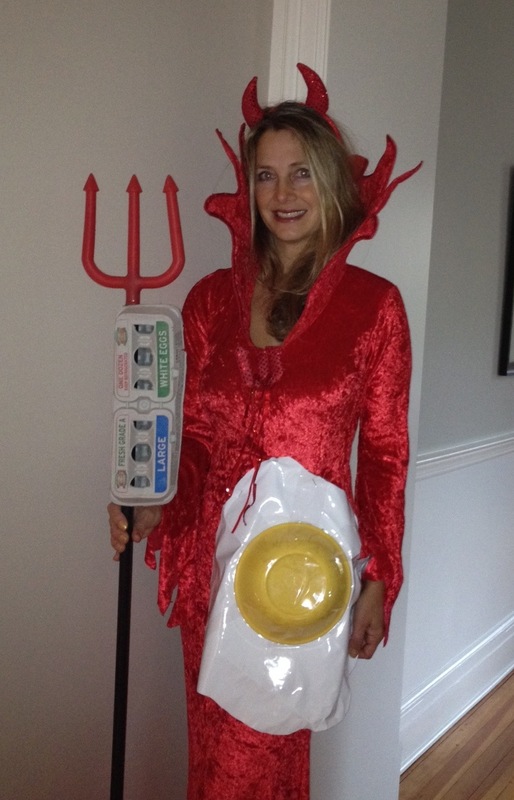 I already had the devil costume and shiny white fabric in the attic (I think I’ve alluded to my pack-rat tendencies? ), so I just needed to pick up a plastic yellow bowl along with the bottled water and paper towels. Can you figure out what I am? This entry was posted in Uncategorized by subeeskitchen. Bookmark the permalink. Hi – the chandelier is a Preciosa model that has been discontinued. The pendants over the island are from Hudson Valley. Hope this helps. Thank you so much for sharing your talents, God bless you!